The End Times Deception study is not about Bible prophecy per se, but about the Flat Earth Theory. 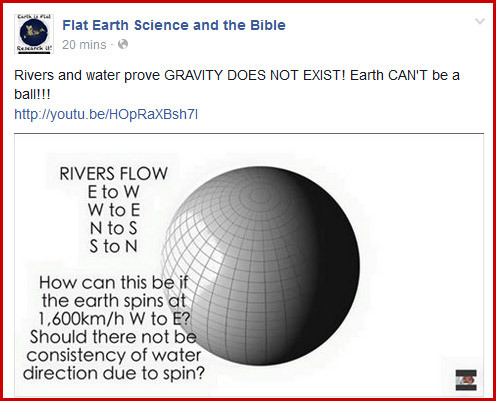 More and more people on Facebook are promoting the flat earth theory, with ridiculous explanations that prove nothing. So I believe that the enemy is getting them to believe in the flat-earth theory, so that others will discount all that they are proclaiming. I think that flat-earthers are going to make everyone so tired of hearing about it, that people will not seek any truth, and not discover that they have been lied to, and that the earth is the center of the universe. Here’s the hitch. Some of the explanations about Earth not flying through space or spinning make sense. Some of the explanations that show the stars circling around the North Star, seem to confirm that Earth is in a fixed position; and it is the stars, Sun and planets which revolve around the Earth. But Satan is the master of the double deception. He has caused the majority of people to believe in the heliocentric view, which has the earth revolving around the Sun. And he has flat-earthers proclaiming that the flat earth is the center of the universe. But nobody is talking about the geocentric globe earth model, which seems to make the most sense. It still has Earth as the center of the Universe, proving a Creator; but earth is not flying through space and it is not spinning. I’m still investigating these concepts, but below are the proofs that I have found so far. I believe that the evil ones are having NASA publish pictures which can be proven to be fake, so that flat-earthers proclaim that it is part of the cover up. But fake NASA images and missions, in and of themselves, do not prove the flat earth. Of course they use CGI to create nice photos, they admit as such. Anyone can buy the SkyView Explore The Universe and Satellite Guide apps to use on their phone, to know where to look in the sky to view planets and satellites. That in itself disproves flat-earthers proclamation that there are no planets or satellites. Stellarium is a free open source planetarium for your computer, showing you where to look for planets and constellations. It shows a realistic sky in 3D, just like what you see with the naked eye, binoculars or a telescope. Add in all of the professional and amateur astronomy photographs of the planets and stars, such as Astronomers Without Borders, and you remove all doubt. Many flat-earthers incorrectly cite the 8″ drop per mile squared formula, as supposed proof of the flat earth. To say that there are no satellites would mean that countless companies and people are involved in the conspiracy to cover up the flat earth; which is just ridiculous! You can simply look at HughesNet Gen4 satellite internet service to see that people in remote locations can get internet service. It would be impossible to receive land-based signals, as flat-earthers claim. I believe that the evil ones are having people like President Obama mention the flat earth, to get flat-earthers to jump on it, and proclaim that is proof. But I believe that the Jesuits of Rome, who control the CIA, NASA, POTUS, the media, and just about everything else; are brilliant in their strategies, and they are merely deceived flat-earthers with these mind control techniques. Flat-earthers cite Isaiah 40:22 to say that the world circle (chuwg) points to a circular flat earth, not a ball. He is declaring that the works of man are nothing as compared to His creativity and power. Then He points out His Mazzaroth, the twelve signs in the circle of the Zodiac, which have proclaimed His plan of redemption from the beginning. The CIRCLE in Isaiah 40:22 is the Zodiac in the sky above, that has 12 constellations in a circle, which declare the Gospel. It is like a curtain which covers the earth, and in which the stars dwell. We see that Elohim tells them to look up to the circle of the stars of the Zodiac. So one can clearly see that when Elohim referred to the circle of the Earth, He is referring to the circle of the Zodiac which acts as a constant witness to those on earth, about His great power, and about His redemption plan. Hurricanes spin counter-clockwise in the Northern hemisphere and clockwise in the Southern hemisphere. There is no explanation of that on a flat earth model, but it still works on the geocentric model. The appearance of the crescent moon and the celestial bodies in the skies, is opposite for people in the northern and southern hemispheres. That would not be possible on a flat earth. They believe that NASA is faking every image of earth, is to pretend that they are the only source of images of the earth. That means that every weatherperson showing storms or hurricanes, with a view from satellite which shows the globe earth, is all faked. All other planets are a globe. Some flat-earthers even say that the moon and the planets are discs, not globes, to try to overcome this point. Some say that the moon does not reflect the light of the sun, but gives off it’s own light; but they can’t explain how the moon would display the different phases as it waxes and wanes. Time-lapse photos of the moon during a lunar partial eclipse, clearly showing the circular shadow produced by the ball-shaped earth. High and low tide proves the rotation of the earth and moon. Unlike a 24-hour solar day, a lunar day lasts 24 hours and 50 minutes. This occurs because the moon revolves around the Earth in the same direction that the Earth is rotating on its axis. Therefore, it takes the Earth an extra 50 minutes to “catch up” to the moon. Since the Earth rotates through two tidal “bulges” every lunar day, we experience two high and two low tides every 24 hours and 50 minutes. Here, we see the relationship between the tidal cycle and the lunar day. High tides occur 12 hours and 25 minutes apart, taking six hours and 12.5 minutes for the water at the shore to go from high to low, and then from low to high. The Southern Cross is only visible to those in the southern hemisphere. 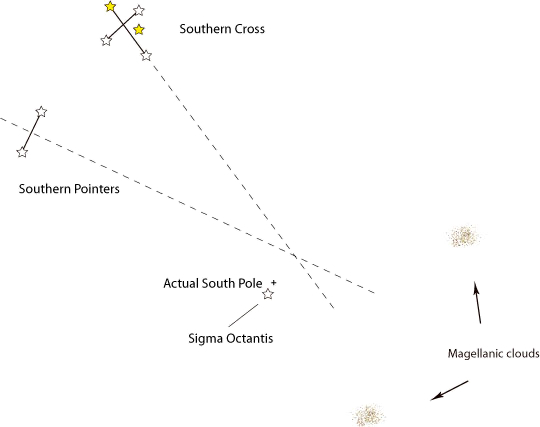 The south celestial pole can be located from the Southern Cross (Crux) and its two “pointer” stars α Centauri and β Centauri. Draw an imaginary line from γ Crucis to α Crucis—the two stars at the extreme ends of the long axis of the cross—and follow this line through the sky. Either go four and a half times the distance of the long axis in the direction the narrow end of the cross points, or join the two pointer stars with a line, divide this line in half, then at right angles draw another imaginary line through the sky until it meets the line from the Southern Cross. This point is 5 or 6 degrees from the south celestial pole. Very few bright stars of importance lie between Crux and the pole itself, although the constellation Musca is fairly easily recognized immediately beneath Crux. This video needs no explanation; it simply and quickly illustrates the biggest problem for the Flat Earth model of the Earth. There is no math involved, it is easy to verify for yourself, and anyone can understand the problem from a single view of this video. 10. All other planets are a globe. 9. Time Zones. It’s always daytime somewhere and nighttime somewhere else. That can’t happen on a flat earth. 8. The Coriolis Effect. Free-moving things deflect to the right if you are north of the equator, left if you are south. 7. You can take a journey, applying only three 90 degree turns, and end up back where you started. That is impossible on a flat earth. 6. You can measure the earth’s curvature, by measuring the shadow created by the Sun. By measuring two different places north/south of each other, you see that they have two different angles, you prove the earth is not flat. 5. Stars change going north or south. The constellations are upside down in the southern hemisphere as compared to the northern view. 4. Magellan navigated the Earth. He and others have traveled West until they ended up where they started. 3. The Horizon. Ships disappear as they move away, bottom first. On a flat earth, there would be no horizon to cause things to disappear. 2. Lunar Eclipses. The shadow of the Earth on the moon is curved. 1. Photographic Evidence. Not all images are from NASA. Flat Earther would have you believe that nobody is allowed to visit Antarctica. They say that it is not a continent on the bottom of the globe earth, but instead that it is an ice shelf that surrounds the flat earth. They say that if people try to visit Antarctica, they will be met with resistance by the military. Apparently someone forgot to tell these people who had adventures there. If you were in Alaska and looked towards the North Star you would see that star remain roughly stationary and all the other stars will circle it like seen in the time lapsed photos here: www.guidescope.net/starfields/circles.htm if you were in South Africa, you will not be able to see the North Star (because the spherical earth is in the way), but if you look due south, you will see the circle of the stars go in the opposite direction. The crescent shape of the moon appears inversely between people in the northern and southern hemispheres. On December 21st at noon, the sun will be at 90 degrees above the horizon at spot along 23.44 degrees south of the equator or along the line known as the Tropic of Capricorn. This is as far south as that 90 degree position of the sun, at noon, ever goes. At that point, the sun’s 90 degree mark of solar noon will move north and continue doing so until June 21st. 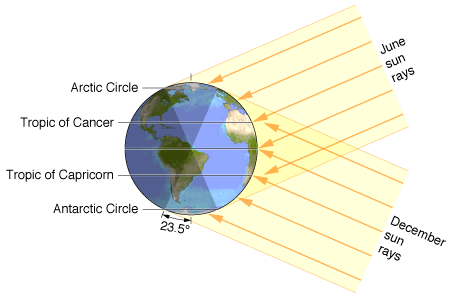 On March 20th, it will cross the equator and on June 21st it will mark its furthest north point along the Tropic of Cancer which is 23.44 degrees north of the equator. These 90 degree marks are only possible on a globe. These geographical variations in the sun’s angle above the horizon also account for the major geographical variations in earth’s climates. The arctic and antarctic regions are almost always cold—even in the summer when they get 24 hours of sunlight a day—because the sun’s angle above the horizon is never very high. And the tropics are almost always warm—even though they never get much more than 12 hours of sunlight in a day—because the mid-day sun is always so high in the sky. The intermediate latitudes, which generally have hot summers and cool or cold winters, are called the temperate zones. The north temperate zone lies between the Tropic of Cancer and the Arctic Circle, while the south temperate zone (where the seasons are reversed) lies between the Tropic of Capricorn and the Antarctic Circle. A compass guides you to true north, which is one place on the earth, the north pole, proving the globe earth. If 1,000 people left different places around the Earth and headed north using a compass, they would all cross paths, as the compass guides them to true north. That is impossible on a flat earth. 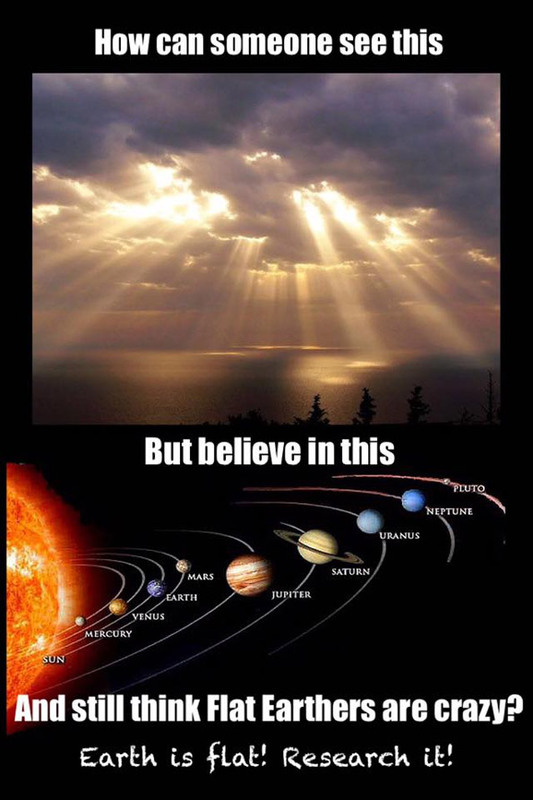 Here are some examples of things that I see flat-earther’s posts on Facebook, which prove nothing. That is a map projection, a azimuthal equidistant projection, which is a systematic transformation of the latitudes and longitudes of locations on the surface of a sphere or an ellipsoid into locations on a plane (3D to 2D). The longitude last expand out, causing countries outer countries like Australia to be exaggerated in size. It’s a useful tool to determine the best flight path. It actually reinforces the globe earth. This is a special kind of stupid, as it ignores the many laws of physics which keeps water (and people, and everything else) from flying off of the supposedly upside-down globe earth. Flat-earthers proclaim that the Sun is not millions of miles away, which may be true. They use images like this to supposedly prove it. 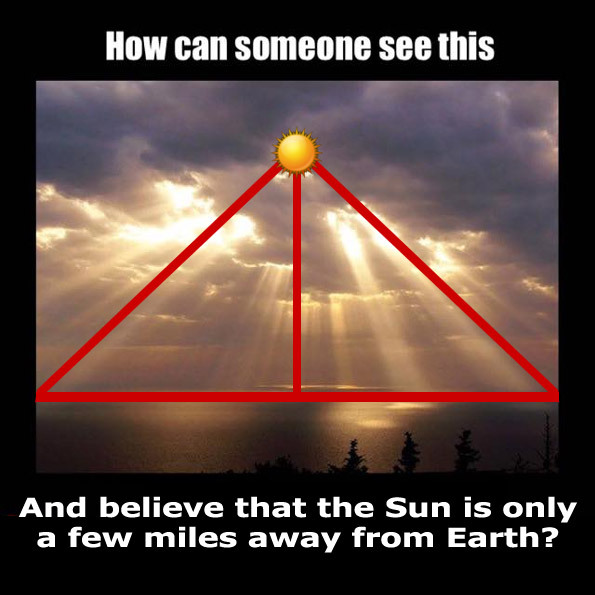 The base of the triangle is only a few miles wide, and the other sides are shorter, so that means that the Sun is only a few miles above the Earth, which in turn seem preposterous. Here is another one of their explanations about the spinning earth, which seems to make sense, but can also be applied to a stationary ball earth. On a geocentric fixed globe earth that is not spinning, the water would simply obey the law of gravity and move to the lowest point. If you have more proof of a globe earth, please share below in the comment section.